IdealShake Super Meal Replacement Shake is the right combination of ingredients to help you lose weight and feel terrific. Specially formulated with the natural sweetener STEVIA, IdealShake Super isn’t just refreshingly delicious in this rich Vanilla flavor, it provides satiating whey protein and fiber, plus essential nutrients to give you the energy you would get from a meal, without the extra calories. 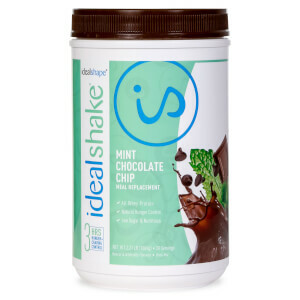 At the same time, IdealShake Super includes our unique Superfood Blend of fruits, vegetables, and greens to boost your nutrition for healthy weight loss. 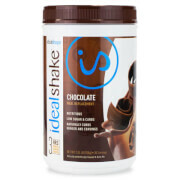 IdealShake Super meal replacement shake is weight loss with a natural edge. Only 110 calories per serving. 12g of protein and 5g of fiber. $1.67 per meal or less! Suggested Use: Replace a one or two meals with an IdealShake Super meal replacement shake, followed by an 8oz glass of water. 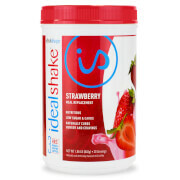 Make sure to eat 5 small, healthy meals each day, which include your IdealShake Super. By eating several tasty and healthy meals throughout the day, you’ll be able to control your hunger better, consume fewer calories, and lose weight! IdealShape Protein Blend (Whey Protein Concentrate, Whey Protein Isolate), Isomalto-Oligosaccharides, Sunfower Oil Creamer, IdealShape Superfood Blend (Blueberry Powder, Apple Pectn Powder, BevGrad (Flax), Spinach Powder, Parsley Powder, Cracked Cell Chlorella, Kale), Calcium Carbonate, Natural Flavors, Maltodextrin, Magnesium Oxide, Salt (Sodium Chloride), Xanthan Gum, Stevia Extract, Ascorbic Acid (Vitamin C), Vitamin E, Biotn, Potassium Chloride, IdealShape Digestve Enzyme Blend (Bromelain, Papain, DigeSEB, Lactase), Vitamin A Palmitate, Niacinamide, Calcium Pantothenate (Pantothenic Acid),Electrolytc Iron, Zinc Oxide, Cholecalciferol (Vitamin D3), Pyridoxine HCl (Vitamin B6), Thiamine Hydrochloride (Vitamin B1), Ribofavin (Vitamin B2), Cyanocobalamin (Vitamin B12), Folic Acid, Potassium Iodide. This does not have as strong of vanilla flavor as I like. Added fruit to make a smoothie peps it up. My husband and I were loyal chocolate superfood shake users. and were disappointed when we found out it was discontinued. We decided to try the vanilla superfood blend and just add cocoa to the mix. It worked good and I am able to mix in fruit for an alternate flavor to the chocolate. Since starting this product late April I've lost over 50 lbs. Not only that but this product along with another vitamin my thinning hair is actually getting fuller and coming in curly. I've recommended this product to others and they have started it and love it. Enjoy my very tasty replacement meal for lunch most days - great in that most of needed vitamins are contained in this delicious liquid lunch and it holds me over until later dinner. And I've no complaint from my doctor about being low on any vitamin or nutrient. So thankful for this product! The super food shake tastes good. I would compare it to the regular shakes I've tried in chocolate, vanilla, strawberry etc. The green color is a bit odd but it doesn't impact the flavor. Loved the Ideal vanilla shake. Big believer in stevia, as a natural sweetener. Will purchase again. Sorry to say, in comparison to the previous order of vanilla, I do not care for the new vanilla. It is between the two, I will take the older version. Love the cookies and cream, especially with some bananas in it. The flavor does take some time getting used to but once you do, it’s good. Keeping in mind that it’s a superfood, infused with stuff that’s good for you, it’s not so bad. I love the flavor of the vanilla shake and the versatility of adding whatever you want! I love this stuff. It’s so rich with vanilla and cream flavors. Tastes like ice cream. I would highly recommend this. I put banana in mine sometimes. So yummy! !